Day 12 at sea: Bish Bash Bosh! It is a very happy rower who writes this blog from a much happier sea than we have seen over the last few days. As the wind drops and the seas settle, so too does my heart rate. Gulliver quietens down and I feel he can take a step back for a while too. 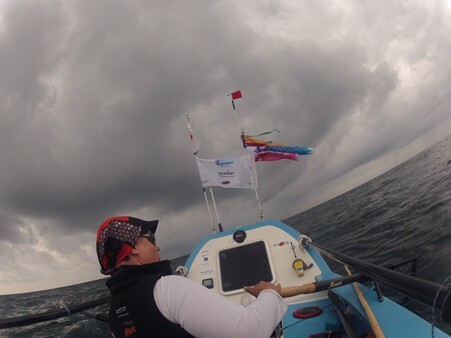 The seas now look about settled enough to pull in the sea anchor and take to the oars again – something we haven’t been able to consider for the past few days while knitting our way back towards Japan in rough seas. For the last goodness-knows-how-many-hours Gulliver has been taking a beating from all angles, smashed and thumped and bashed by the ocean. It is the roughest stuff I have ever been through in a little boat and I shall be happy not to go through too much more of it before the other side, too. That said, I am pretty certain we have a fair few more beatings ahead. So the seas have settled and Gulliver and I can once again get rowing. Hurrah! 14 Responses to Day 12 at sea: Bish Bash Bosh! Hi Sarah, great to read about how you are doing, I am sharing your communication with others via social media, we meet after your last great rowing quest at the Marriott Hotel in Peterborough when you kindly agreed to speak with a group of business people over breakfast. Well done and keep going you are a true inspiration to many and I feel proud to have had the pleasure of meeting you. Hope to meet you again when you are back home. Good news for your rowing again to Canada. Row & row to the East as long as you can possible for next several days. The typhoon #2 will be approaching to you. The God helps you the good progress & safe rowing. Oh yeah! She writes again! Dare I assume that you are over the queasiness? Or is it the music deprivation that spurred the Everest? Regardless, SO GLAD you had the iPod situation sorted out. Was so worried you’d have the whole 5 months in silence. 🙂 Happy days! Be safe and think of pea in the pod profanity. Woop! And I have used a very wrong word, I found. Scratch that ‘profanity’ and replace with ‘profoundness’. Sorry! (English is NOT my first language). Great news on the change in weather and that you and Gulliver are able to make progress in the right direction. Long may this calmness last. I look forward to your updates, keep going Sarah and Gulliver you are a fantastic inspiration. Hi John, nice to meet you! Well, the OrangePot HQ tried very hard to provide the cupcakes for the Mouse. But with the ever changing departure schedule, all the batches were consumed before they made it into the boat. However, 20 something bags of OrangePot special cookies of different varieties made it into Gulliver. dry-bagged and all. They experienced some certain Mouse and Cookie Monsters attack at the marina on the day of packing, but I believe some made it into the boat! Also there were some brownies and banana raisin bread that was baked on T-2. I believe those brownies and banana raisin bread are gone, but the Mouse is slowly working through the cookies batch. I sent my friend Kevin O’Neil, the acupuncturist/ Chinese medicine man, a note about your queasiness. I hope we can find a remedy for you. I gave him your link so he may contact you. I would recommend Ginger but a walk to the store is right out. So glad to read that things are settling! Hope your stomach takes note and follow suit! hi sarah,glad things have come good and that your ipod is ok again,great to see the wildlife pictures and that you are literally in calmer waters for a while,hope the mile ticking off is going well,will have a few ciders for you at the worlds smallest pub this weekend during the folk and cider festival here in actually sunny cleethorpes! Glad to hear things are settling down for now & particularly delighted to hear that the iPod is working. What a disaster that could have been. That photo makes me feel wet, cold & seasick – good job it’s you out there & not a softie like me! Keep up the fantastic rowing & writing. Great to read you’re well and the weather is getting better. Good Luck and all the best for the next days! Viewing your progress on the google map tracking program, very interesting to see how you get pushed around by the storms/winds. However, I do note that you are making it in the right direction – good on you! Keep going, and keep your spirits up!